You may have seen these around your gym and just thought they were another one of those “gimmicky” pieces that seem to pop up out of nowhere. But in fact, the kettlebell has been used all over the world for years as a tool to increase strength, cardiovascular health, power, and mobility. One of the greatest and most versatile pieces of exercise equipment is also one of the most ignored and improperly used pieces of equipment. It has been around for centuries and can quickly take your fitness to a whole new level. Whether you want to work on strength, cardio, or a combination of the two, this piece of equipment can do just about anything. So what is this mysterious device I speak of? Itâs the kettlebell, of course. You may have seen these around your gym and just thought they were another one of those âgimmickyâ pieces that seem to pop up out of nowhere. But in fact, the kettlebell has been used all over the world for years as a tool to increase strength, cardiovascular health, power, and mobility. While more and more gyms are starting to carry kettlebells, most people donât know how to use them. And swinging one around without proper technique can not only be ineffective, but itâs also dangerous. Before we get to the moves, you need to know some basic things about form. 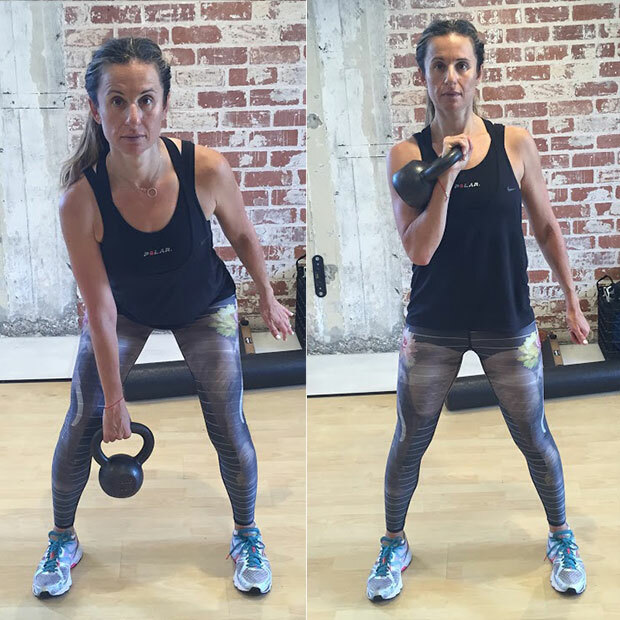 Your hips are the main âmoversâ in many kettlebell exercises. For example, while a Kettlebell swing may look like your arms are the main driving force, it is actually the hips. In fact, when youâre performing kettle bell swings properly, your arms should not be doing any work aside from holding on to the kettlebell. Your wrists should always be in a neutral position during kettlebell movements; they should never bend backwards or forwards. Your grip should always be loose. You want to hold on to it, definitely, but at no point should you have a death grip on the kettlebell. Find your rhythm. Kettlebell movements are largely based on momentum, so it's important to find your own rhythm and pace, which will keep you safe and offer the benefits. Start with your feet hip width apart with both hands on the handle. Your grip should be loose but stable (no flying kettlebells, please). From here, hinge your hips backwards as far as you can, while bending your knees slightly. Swing the kettlebell between your legs and then swiftly push through your hips to straighten your legs and swing the kettlebell up to chin height. This takes practice, so start with a light kettlebell until you get the hang of it. Repeat this 10-15 times. Start with the kettlebell in your right hand at your chest with your hand in a neutral grip position (also known as the rack position). Lower into a squat, bending your knees to 90 degrees (not shown). From here, straighten your legs, press your right arm overhead and rotate your wrist to palm forward. Your legs are used to create momentum, so this movement will be a quick one. Make sure you keep a neutral wrist throughout the entire movement. Repeat this 6-8 times before switching to the left hand. Start with your feet hip width apart, holding the kettlebell in front of you with your right hand. Your palm should be facing you. Lean down and lower the kettlebell below your knees. In one motion, stand up straight again and curl the kettlebell to your chest, back into the rack position. You donât want the kettlebell to hit your wrists. 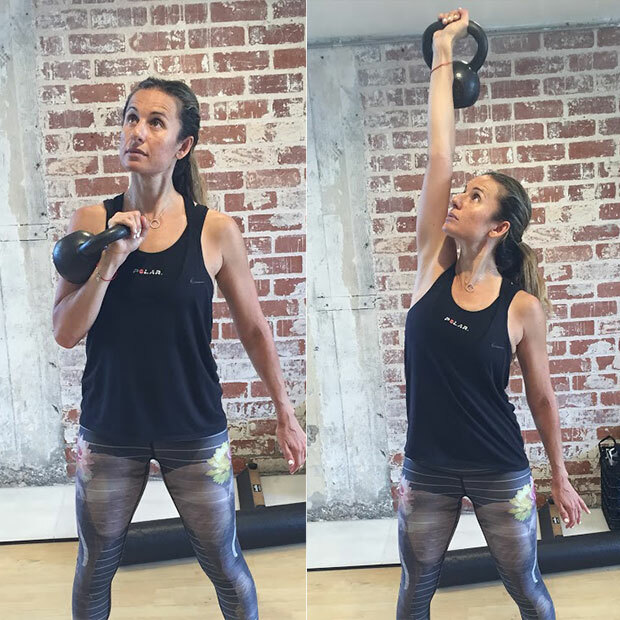 Youâll probably have to try a few times to find your rhythm so that the kettlebell with settles nicely into your wrist, so be gentle. And don't give up. Repeat this 6-8 times before switching to the left side.